Every year, the automation specialist F.EE from Neunberg in Bavaria installs so many control cabinets that they would stretch for an incredible four kilometres if placed alongside one another. Last year, one of the high-profile projects was a demanding plant control system for a crisp manufacturer. The robust cable and control cabinet technology comes from Bosch. 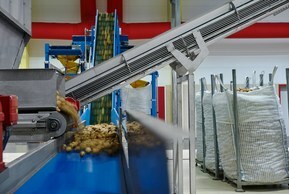 The crisp manufacturer invested in a completely new system for a new building. 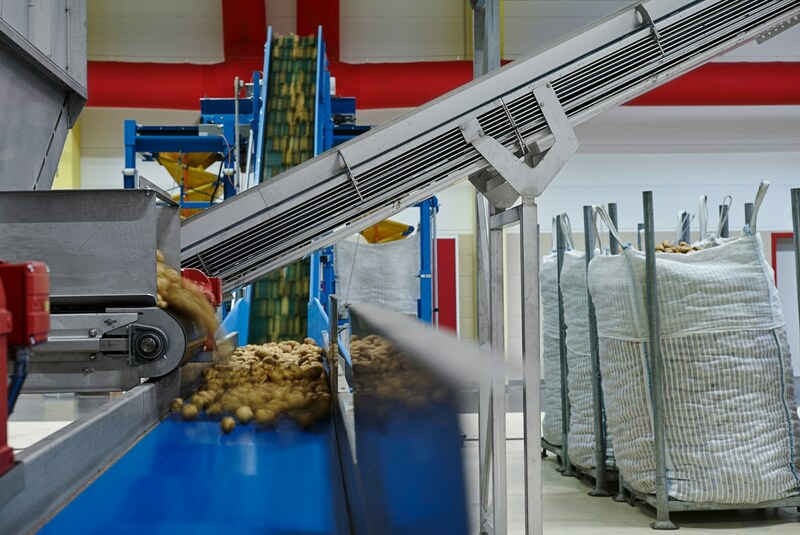 Before being turned into crisps in the factory of a snack producer, they first have to pass through a complex labyrinth of conveyor belts, chutes and containers, where they are cleaned, weighed and sorted according to size. The dust produced has to be washed off daily - and only very robust technology can cope. To ensure that the plant will be able to remain in operation for at least 25 years, it was clear from the outset that the components used needed to be of the very highest quality and durability. All of the control cabinets are arrayed in the factory centrally and extending for metres along the walls, while some are compact housings attached to the sorting machines. The power distribution technology and the controller that controls all the drives and around 400 sensors are protected by stainless steel cabinets. However, the Rittal cabinets are located at a safe distance, outside the process area. They are used for central installation of the control and switchgear technology. They are mounted high up on an impermeable concrete tank. The tank itself contains several kilometres of Lapp cables, which run from the cabinets through open cable ducts under the ceiling to the motors and sensors. They also have to be cleaned and are suitably robust as a result. 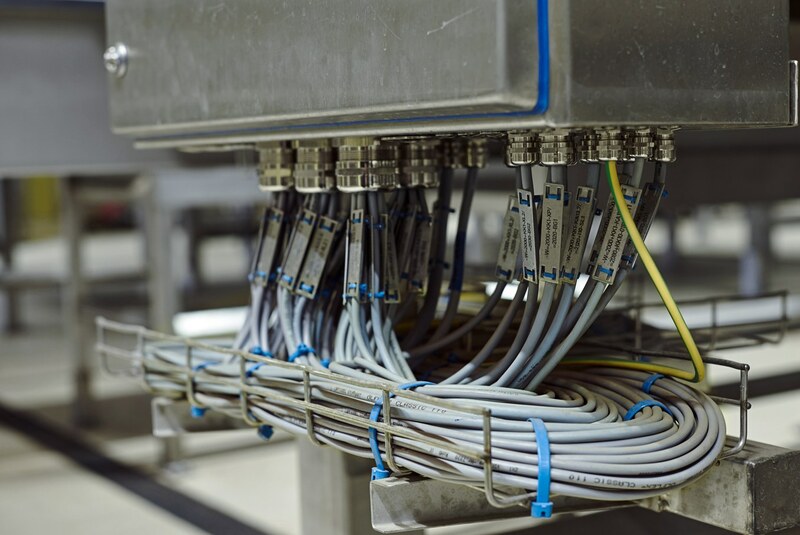 The cables used in this plant include the ÖLFLEX® CLASSIC 110, the ÖLFLEX® CLASSIC 115 CY and the highly flexible ÖLFLEX® FD 810 CP as well as the ÖLFLEX® LIFT F in drag chains and the ETHERLINE® PN Cat.5 Y FLEX FAST CONNECT Profinet cables. In addition, various SKINTOP® cable gland versions ensure hermetic sealing. All cables used in the potato sorting process are labelled with stainless steel badges on the outside of the control cabinets, secured with cable ties . Earthing strips are also installed at several points in the control cabinets, where the shielding for certain cables is clamped. The project in Neunburg represents another success for Lapp in the food and beverage industry. The Lapp range now includes numerous new products specially designed for use in the food industry. They include many EHEDG certified products designed to comply with Hygienic Design principles. They have smooth surfaces with no recesses where food residue or bacteria can accumulate. The Lapp cables also have a robust sheath, enabling them to withstand regular exposure to cleaning and disinfection agents. The F.EE control cabinet production centre is just a stone’s throw away from the crisp factory. As well as reliable and on-time delivery, costs count for a lot. No compromises are made on quality, as costs need to be calculated over the entire service life of the plant. This is why Lapp and Rittal are the partners of choice for all F.EE projects.